Will Cate’s quest for revenge cost her everything? Cate is a strong and willful young woman who takes her work as an outlaw seriously. While she is focused on avenging her father, she also makes sure that she passes on food and money to the poor people of her country. I like that Cate doesn’t have any delusions about the path she’s chosen. She knows that sooner or later, she is likely to meet with a violent end. All she hopes for is to avenge her father before her time comes. Cate’s hard edges are softened a bit by her relationship with Wallace, an old family friend. Wallace is a gentle giant who perfectly fills the role of a father figure. Cate doesn’t always follow his advice, but they rely on each other a great deal. I had a hard time getting a good sense of Cate and Owen’s connection. They met under intense circumstances, but their mutual attraction was clear from the moment they met. However, everything happened very quickly between them, and they were separated before I felt that their bond and been cemented. Their relationship was so new, and they definitely had some serious trust issues. Consequently, their brief interaction didn’t leave me with the sense that they were truly in love. Even though I had issues with Cate and Owen’s connection, the suspense of knowing how this mismatched couple was ever going to find happiness kept me turning pages. I truly had no idea how Owen was going to rescue Cate. Even though he is a noble, Owen can do very little to help Cate. Her fate seems to be sealed. Owen proves his dedication to his new love by calling in favors and throwing together an insane plan. If even one thing goes wrong, it will all be for nothing. Cate is practically on death’s door. Will Owen be too late? 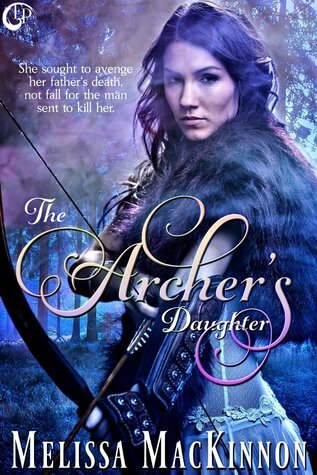 In enjoyed reading The Archer’s Daughter. The pacing is very well done and the action is intense. Fans of historical romance might want to give it a try.